Once the weather warms up, many of us get the camping itch. Something about summer just makes us want to flee to the hills for some much needed therapy on Mother Nature's big green couch. To explore the back country safely and comfortably, you need the right equipment - and although setting up camp usually happens on the ground, a new trend of suspended tree tents is taking camping to new heights (literally). If you're longing to release your inner Mowgli by sleeping amidst the treetops, the six hanging tent designs featured below are the place to start. These dewdrop-shaped Treetents by Dutch sculptor and designer Dré Wapenaar were originally created to make life a little more comfortable for tree-sitting activists. Soon, however, Wapenaar realized that lots of people might like to experience a night of peaceful sleep in the arms of a big tree. Each Treetent measures thirteen feet tall with a 9 foot diameter and is composed of a steel frame wrapped in canvas. The interior comes complete with a roomy hardwood sleeping platform and a round mattress that’s big enough for a family of four. Ever wanted to know what a caterpillar feels like when it crawls into its comfy cocoon? Luminair’s spherical tree tent might be the closest a human can get. Built using only recycled materials, each tent sports a 3 meter diameter spherical frame of aluminum and green ash covered in a tailored cotton canvas. After anchoring the frame to nearby trees, two adults can crawl inside to experience the warmth of 100% wool winter thermal liners, along with a wood stove, water storage and options for renewable electricity. 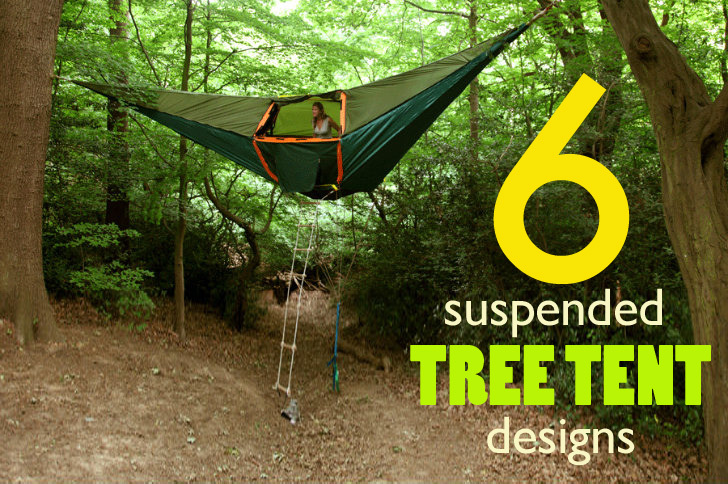 It’s hard to imagine sleeping in a suspended tree tent without a little unexpected motion. Without the ground to provide stability, the tents often bounce, or rock from side to side. For younger campers, this just adds to the excitement, especially when zipped up inside a Treepee. This unique tent was designed to combine “the timeless appeal of a tree house with the excitement of aerial suspension and a trampoline”. The tent’s special fabric provides a UV protection factor of 50+, pockets on the inside allow for storage and a bag on a pulley allows essential supplies to be hauled up into the ‘den’, and bug nets on the windows allow air to circulate without letting critters in. 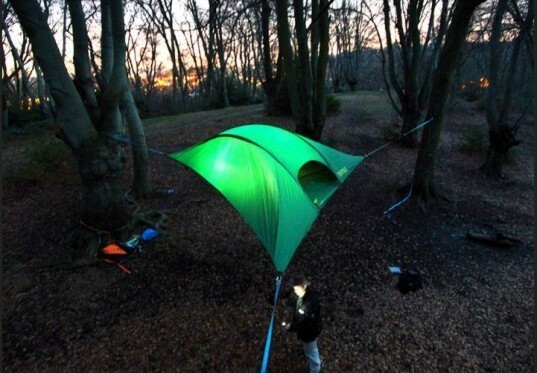 It’s a bird, it’s a plane, it’s a….super cool tent? Half tree house, half human-sized birdcage, the Tree Tent hangs quietly in a tree at The Secret Campsite in Sussex, England. “The idea of sleeping up amongst the trees has always fascinated me,” designer Jason Thawley told CoolCamping.com, “but the design of the tree tent is inspired more by the structure and fabric of yurts and tipis than the old idea of a rickety wooden treehouses that every boy wanted.” Inside the orb, there’s a ceiling skylight and windows by each of the two single beds. There’s also enough space for a table and a wood-burning stove. Too keep you warm, the tent features a thick layer of breathable insulating material is mixed with re-cycled clothing, that’s woven together by quilt-makers in Lancashire. Ever woken up in a tent with a rock digging into your spine? Or happened upon a perfect campsite only to find out that the slanted ground won’t cooperate? These common camping issues disappear when sleeping in the Stingray by Tentsile. In a matter of minutes, the tent’s two (yes only two!) poles are inserted into a polyester fly sheet and a set of tree straps. The interior is accessible through a floor hatch or side door via a collapsible ladder. The Stingray features a reinforced floor and three large hammock sleeping areas. in addition to handy drink holders, luggage nets, phone pockets, and tablet pouches. You may never want to come down! While some of the other tents featured in this post are best for just a couple or maybe three small adults, the AElph Alpha is the tree suspended tent for the entire family. Made right here in the USA, this tent has an overall length approaching 10′ and a width at the head end of nearly 4′, providing a comfortable sleeping area—at least 7’— in its taper toward the foot. There’s plenty of room to stand up, and a light loop for an interior overhead lamp. Besides internal storage, boots, packs, and other gear can be lashed, high and dry and off the ground at various points around the outside perimeter of the tent. There’s also an optional Gear Net that can be installed under the whole footprint of the tent for even more easily accessible storage. The designs are incredible! Never had a thought that I can hang up my hammock that high! I've also seen some useful tips at exploreserac.com, and I think that I'll be setting up for a camp any time soon. When camping, the number one mundane thing about civilization that you often miss is a simple table. You don't know what a luxury the ability to set things on a flat, stable surface is until its gone. The lid of a cooler can be the difference between an enjoyable dinner and a hair-tearing experience trying to assemble food. It's the difference between struggling to put in your contacts in the morning and desperately trying to hold everything in one place, as they roll off your backpack into the corners of the tent. A lot of suspended tent designs seem to ignore this. They make no provision for the difficulty that users will experience when trying to navigate in a bouncy, floor-less, sloping sack. The Tentsile Tent featured in the banner is a great example of this problem. Of the ones shown here, 4 out of 6 have rigid frames and floors that makes them not so much portable tents as treehouses made of canvas. Good for long-term permanent campsites, but little else. 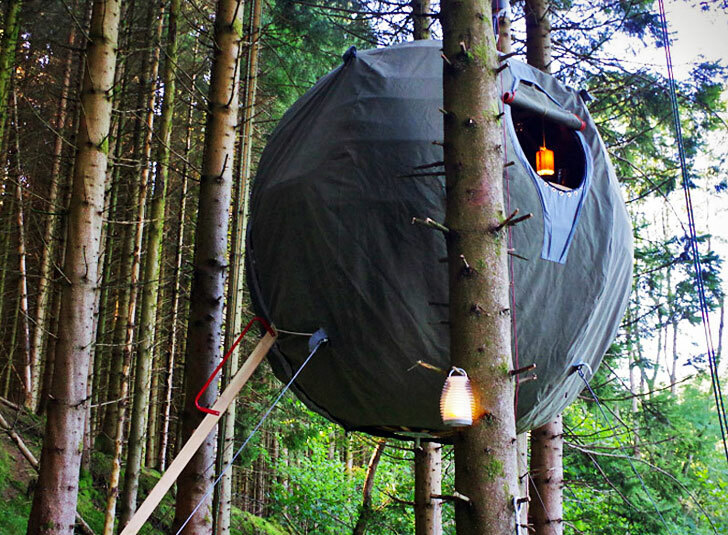 (The treepee, at least appears to be easy to set up, permitting it to be useful for drive-in car camping.) Of the other two, the stingray seems to at least acknowledge this problem with numerous pouches and built-in hammocks. But the other one? Its height is pretty pointless. Good luck trying to stand in something like that. Overall, I suppose I can see something like this being useful for camping in very swampy areas. Getting off the ground keeps you drier, cooler, and less intimate with animals whose acquaintance you might not want to make. But is there any other reasonable use-case for a suspended tent such as these? These dewdrop-shaped Treetents by Dutch sculptor and designer Dré Wapenaar were originally created to make life a little more comfortable for tree-sitting activists. Soon, however, Wapenaar realized that lots of people might like to experience a night of peaceful sleep in the arms of a big tree. Each Treetent measures thirteen feet tall with a 9 foot diameter and is composed of a steel frame wrapped in canvas. The interior comes complete with a roomy hardwood sleeping platform and a round mattress that's big enough for a family of four. Ever wanted to know what a caterpillar feels like when it crawls into its comfy cocoon? Luminair's spherical tree tent might be the closest a human can get. Built using only recycled materials, each tent sports a 3 meter diameter spherical frame of aluminum and green ash covered in a tailored cotton canvas. After anchoring the frame to nearby trees, two adults can crawl inside to experience the warmth of 100% wool winter thermal liners, along with a wood stove, water storage and options for renewable electricity. 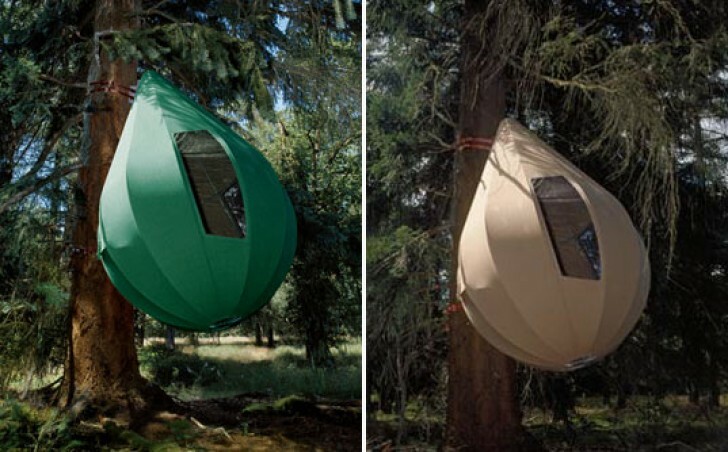 It's hard to imagine sleeping in a suspended tree tent without a little unexpected motion. Without the ground to provide stability, the tents often bounce, or rock from side to side. For younger campers, this just adds to the excitement, especially when zipped up inside a Treepee. 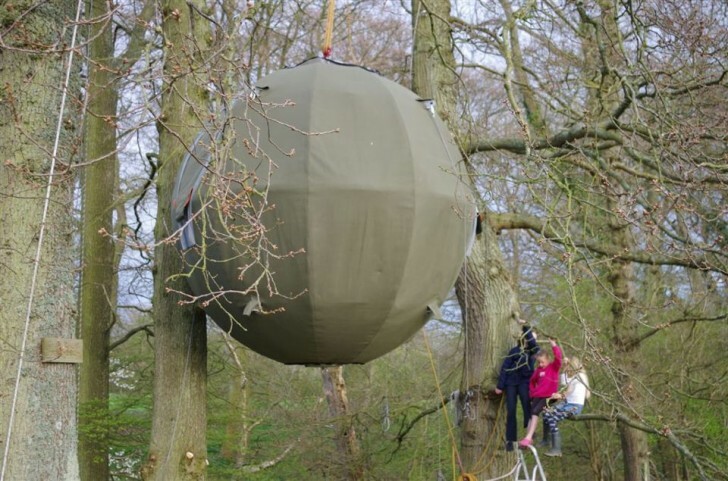 This unique tent was designed to combine "the timeless appeal of a tree house with the excitement of aerial suspension and a trampoline". The tent's special fabric provides a UV protection factor of 50+, pockets on the inside allow for storage and a bag on a pulley allows essential supplies to be hauled up into the ‘den’, and bug nets on the windows allow air to circulate without letting critters in. It's a bird, it's a plane, it's a....super cool tent? Half tree house, half human-sized birdcage, the Tree Tent hangs quietly in a tree at The Secret Campsite in Sussex, England. "The idea of sleeping up amongst the trees has always fascinated me," designer Jason Thawley told CoolCamping.com, "but the design of the tree tent is inspired more by the structure and fabric of yurts and tipis than the old idea of a rickety wooden treehouses that every boy wanted." Inside the orb, there's a ceiling skylight and windows by each of the two single beds. There’s also enough space for a table and a wood-burning stove. Too keep you warm, the tent features a thick layer of breathable insulating material is mixed with re-cycled clothing, that's woven together by quilt-makers in Lancashire. Ever woken up in a tent with a rock digging into your spine? Or happened upon a perfect campsite only to find out that the slanted ground won't cooperate? These common camping issues disappear when sleeping in the Stingray by Tentsile. In a matter of minutes, the tent's two (yes only two!) poles are inserted into a polyester fly sheet and a set of tree straps. The interior is accessible through a floor hatch or side door via a collapsible ladder. 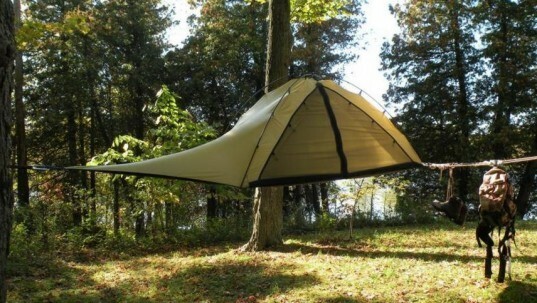 The Stingray features a reinforced floor and three large hammock sleeping areas. in addition to handy drink holders, luggage nets, phone pockets, and tablet pouches. You may never want to come down! 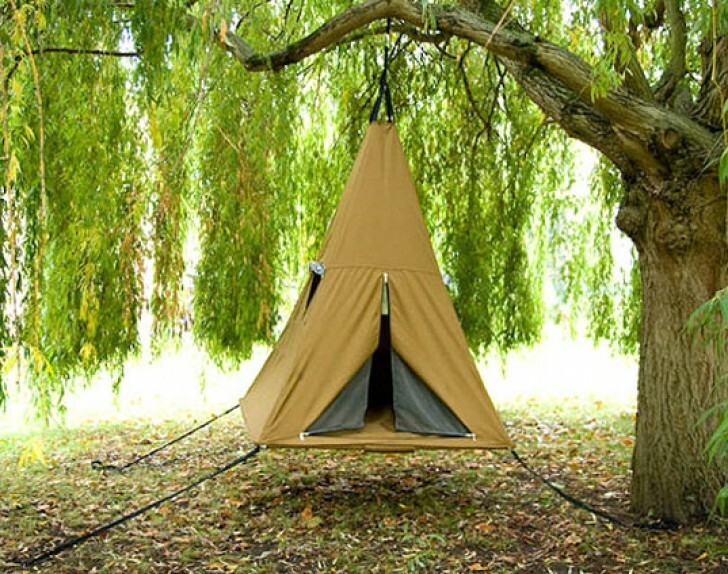 While some of the other tents featured in this post are best for just a couple or maybe three small adults, the AElph Alpha is the tree suspended tent for the entire family. Made right here in the USA, this tent has an overall length approaching 10' and a width at the head end of nearly 4', providing a comfortable sleeping area—at least 7'— in its taper toward the foot. There's plenty of room to stand up, and a light loop for an interior overhead lamp. Besides internal storage, boots, packs, and other gear can be lashed, high and dry and off the ground at various points around the outside perimeter of the tent. There's also an optional Gear Net that can be installed under the whole footprint of the tent for even more easily accessible storage.